As I drove home from NYC the other night after leaving the Starchefs International Chef Congress all I could hear were the words from some of the best chefs in the world. I was humbled to be in the same room with Chefs like Charlie Palmer, Thomas Keller and Dan Barber to name a small few. Each speaking to a crowd of chefs, cooks and industry personal hoping to get the one piece of inspiration that they will take back with them to their kitchens and use to continue to create and in Chef Kellers words "nurture" their guests. The theme of this years ICC was Art vs. Craft...and after a few days of debating there is no right or wrong answer but a common ground among these industry leaders that first we are craftsmen, repeating our task over and over again until it is perfect. In my opinion this is what separates chefs around the world. Some are never happy with a dish, despite positive feedback and praise from guests, these chefs are always looking to improve on the dish never settling and always looking for an even more perfect dish. While other chefs use the "copy and paste" method to put a dish out without much thought or repetition. Good? maybe? But perfection, not even close. One piece of knowledge that stuck with me was from Charlie Palmers executive chef in Los Angeles...he said during one of their first tastings together Chef Palmer asked the young chef is the dish that he just created was good? Chef says "yes, very good" ....Chef Palmer asks " Is it good enough to return tomorrow and order the same dish again?" Chef says " no". Chef Dan Barber from Blue Hill , gave the demo of the event....a full house, standing room only, to hear what he had to say about combining molecular gastronomy with farm to fork...But his method is not what you might think. What about turning used pig bones into pig charcoal? Used Lamb head into lamb charcoal? Lobster bodies into lobster charcoal? Grilled corn grilled over corn husk charcoal? using science to help grow the perfect carrot, or what about the best tasting unnamed tomato you have ever experienced? He tracks the animals on his farm from birth, and is starting to use scientific tools like the ultra sound to determine fat distribution before the animal is slaughtered...therefore being able to tell if its ready, or even better to keep it alive and breed with it to continue to produce high quality berkshire pork for his charcuterie program. He talked about using used hazelnuts after being pressed for hazelnut oil...he takes them and sprinkles them over the soil where he groes his saltruse....hazelnut flavored saltruse? The conference was inspiring, motivating and an experience I will never forget. I thirst to get in the kitchen again and start to use what I have learned to become a better cook!! Eating Local During Winter Months? If you're been shopping at farm stands and farmer's markets or enjoying your CSA this past summer, you may have been worrying about what to do now that the leaves are starting to fall and first frost is right around the corner. Is it time to say goodbye to those beautiful, locally-grown fruits and vegetables to which you've grown accustomed? Well the farmers in Upstate New York say NO! 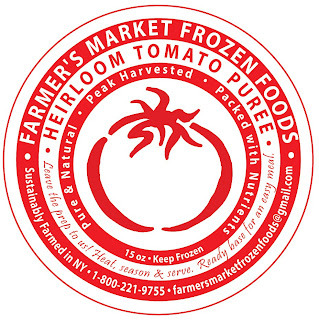 Farmers Frozen Foods is regionally processed by small family farmers in the Up state NY area who are sustainable heirloom, natural, and authentic. They manage the program like a summer CSA only the food you receive is frozen, the frozen product allows you to eat and support local farms all winter long! In 2005, the SARE (sustainable agriculture research and education) grant award helped with the development of packaging and distribution. They are finally being recognized by more good eaters and gourmands. The work continues...increasing their network of small farmers -they claim they will never become one large commercial farm. The growing is done in joint venture with multiples of small farmers bringing their naturally grown crops to regional processing facilities. New Yorkers support lots of family farms when they buy Farmers Frozen Foods. their small batch processing allows for stricter quality control standards to achieve maximum nutrients. I know for a fact that many farms here in Mass & R.I. are freezing their crop for winter storage and usage, but it would be great to have an organized program set up like this to allow more people to enjoy local through out the year. If there is anything like this out there , please comment and let me know..... We may not be Yankees fans here in Boston, but I am a big fan of what the Farmers Frozen Food team is doing.